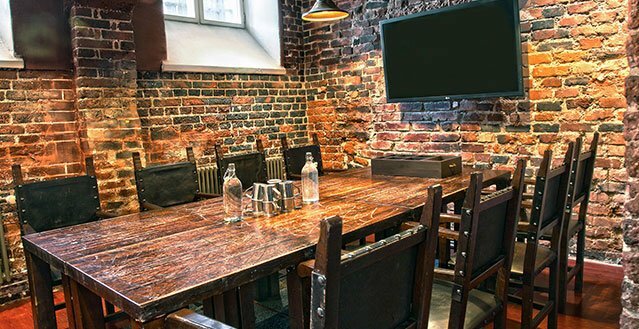 Our assembly room refurbished into the old prison chapel, the four red-brick-clad meeting rooms and Restaurant Linnankellari offer an excellent setting for meetings, negotiations and corporate events. The state-of-the-art equipment, impeccable service and the unique atmosphere inside old prison walls are bound to sentence you to life – ­with memories of quality, style and class. 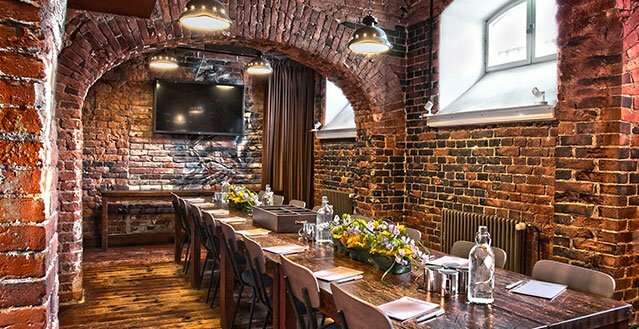 Hotel Katajanokka’s church is a versatile hall with plenty of character and warmth. The historic altar, original altarpieces and the church organ have set the pace of many weddings, christenings and other spiritual ceremonies for 170-some years. But this six-metre-tall and 120m2 restored space adapts to a plenty more: Kirkko is also an ideal stage for dinners, seminars, as well as press and cocktail events. With this space only imagination, or heaven is the limit. “Kakku” is an octagonal cabinet with red brick walls and a large window. The floor area is little over 30 m2. The name “Kakku” is Finnish prison slang for “Sentence”. Kakku used to be the prison kitchen. For dining, Kakku accommodates 20 persons around one diplomatic table and 24 persons around two diplomatic tables. Sakko is rectangular-shaped meeting room with vaulted ceilings, sized approximately 25 m². The capacity of this meeting room in diplomatic table is for 20 persons. The name “Sakko” means “Fine” in Finnish. Sakko used to be the prison cellar. 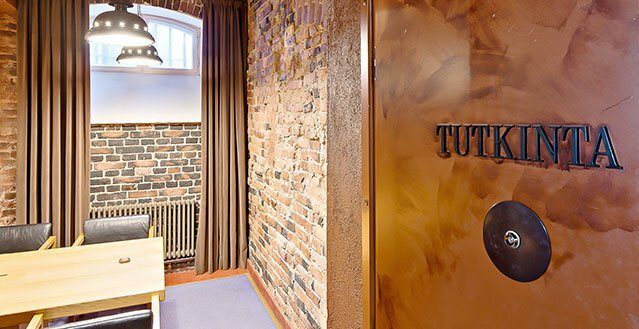 Tutkinta is a 18 m² red-brick-walled meeting room with vaulted ceilings. The capacity of this meeting room in diplomatic table is for 10 persons. The name “Tutkinta” means “Investigation” in Finnish. This meeting room used to be a prison storeroom. Tuomio is a relaxed Think Tank for 10 persons, with everything included for good meetings. The name “Tuomio” means “Sentence” in Finnish. 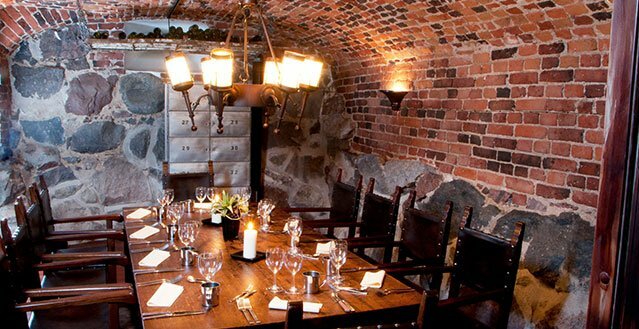 The Wine Cellar is an atmospheric meeting room with vaulted ceilings, sized about 18 m². The room seats 8-10 persons around a big diplomatic table. The wine cellar is connectable with our sauna, so you can book them together. 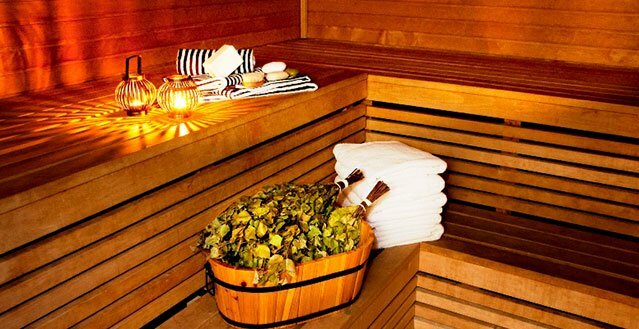 The private sauna is an essential part of Linnankellari’s meeting services. It’s the perfect place to unwind after a meeting or perhaps before your dinner. The sauna connects with our adjoining Wine Cellar meeting room. All meeting packages include: meeting room, meeting host services, data projector, screen, flip chart, pens, notepads and broadband internet connection (Wifi / LAN).